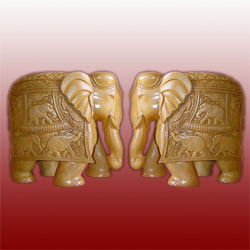 We are offering our customers an excellent quality range of Carved Wooden Elephants. These find extensive usage in the decoration of houses and other commercial establishments and helps in enhancing the beauty of the complete decor. Our items have high quality handwork making them very attractive. Our firm specializes in offering a premium quality Decorative Wooden Elephants. The offered statues are crafted and designed under the guidance of adept craftsmen using topmost quality wood and modern carving tools. These wooden elephants are available in various colors and designs to cater diverse requirements of our customers. Apart from this, various embellishments are engraved on these statues to enhance their beauty and offer an appealing appearance. 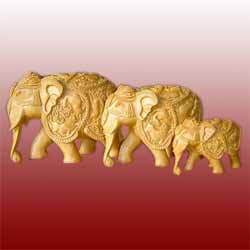 With our years of experience and knowledge, we are affianced in offering a wide range of Wooden Carved Elephant. 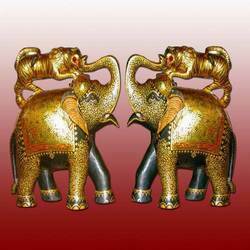 Being a quality oriented organization; we are able to offer Decorative Elephants Pair that are ideal option for fulfilling the decoration and gifting needs. Offered wooden statues are designed from the premium quality raw material and advance tools keeping in sync with market trends. Our wooden statues are perfect to keep in homes, offices and other places. Moreover, our valuable customers can avail these wooden statues from us at reasonable prices. 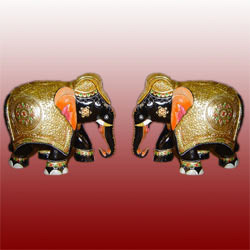 Our company is engaged in offering Wooden Elephants Pair at the most competitive prices. Appreciated for their supreme finish and polish, these Elephant Wooden Statues are designed with the help of latest techniques and premium grade wood. Apart from this, various embellishments are engraved on these statues to enhance their beauty and offer a appealing appearance. 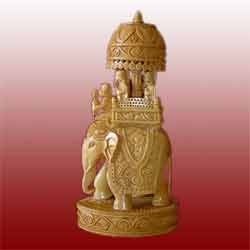 Our organization is highly engaged in this domain, we are offering an excellent quality Elephant Wooden Statues. Our offered wooden statues are designed by our skilled professionals using quality-approved wood and latest carving tool. We offer these wooden statues in diverse colors, sizes and designs as per customer’s requirements. Besides this, our wooden statues are used to enhance the interior look of houses and other places. 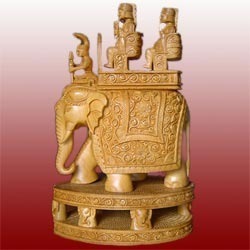 By keeping track of the latest technological developments, we are offering a superior quality Elephant Wooden Statues. Our provided wooden statue with detailed carving is brilliantly hand crafted and detailed by our own master craftsmen. Also, our provided wooden statue is accessible in different designs & sizes to suit various customers’ requirements. Our wooden statue is checked by skilled workforce so as to deliver a defect free range. 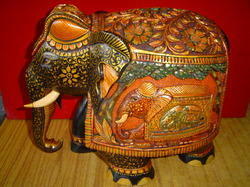 Looking for Carved Wooden Elephants ?